Gage Glass makes blast gate observation ports for all applications and vessels of all sizes. With a variety of different sizes, configurations and designs, Gage Glass makes it easy to find the observation port you need. The flanged to threaded (F/T) blast gate observation ports offer a unique construction that can be easily installed for many different applications. Flanged to threaded blast gate observation ports (F/T) are made with opposing designs on either side, allowing you to place the device as needed. 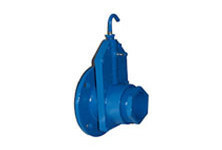 Like most blast gate observation ports, the flanged to threaded port is made with a glass lens, gaskets and rings secured with a metal bushing. The blast gates of varying sizes are equipped with a stainless steel sliding mechanism that allows the port to be safely and easily cleaned. This means if the glass is obscured by smoke, grease or other debris, it can be easily removed, cleaned and used like-new again. The flanged to threaded observation port is also equipped with an additional cooling mechanism. The optional purge connection on the glass can be opened to release hot air from the vessel, helping to reduce heat for viewing. Gage Glass offers different types of glass for each port including Pyrex and quartz, and depending on the types of glass you choose, the blast gate will withstand varying temperatures as hot as 2,048 degrees F.
Browse the flanged to threaded blast gate observation ports available and see the specifications online to find the right size and configuration for your needs. For more information, to get a quote or place an order, call Gage Glass today at 800-780-3776.